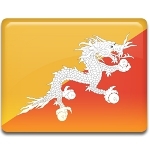 Druk Gyalpo is the title of the King of Bhutan, which can be translated as Dragon King. The title was established in 1963 after adoption of a new constitution. Jigme Singye Wangchuck was the fourth Druk Gyalpo, who became the King of Bhutan in 1972 and ruled the country till his abdication in 2006. Representatives from foreign countries were invited to the coronation of Jigme Singye Wangchuck, which was very unusual. The rule of the fourth Druk Gyalpo featured modern progress and reforms in Bhutan, the state firmly established itself as an independent and sovereign nation. King Jigme Singye Wangchuck may be, perhaps, regarded as the greatest monarch in Bhutan due to his two important achievements. During his reign Bhutan began steady progress towards democratization and a policy of Gross National Happiness was implemented. This policy became an alternative to Gross National Product, when a true progress is measured by how much money the nation made, while Gross National Happiness measures how much happier the nation is.